I had a couple of very over ripe bananas. Mike mentioned that we should think about throwing them out because no one would eat them in the state they were in. I told him that I was thinking about making banana bread with them. But the recipe that I have for banana bread takes three bananas, so I wasn’t quite sure that I wanted to go that route. That is when I remembered that I had a recipe for banana bars, so I found it in my recipe box and sure enough it called for two bananas. When looking at the other ingredients that were listed on the recipe I saw that they were in my refrigerator or my pantry so I was set to go. Mike was thrilled with the thought of banana bars. My mom makes these once in awhile and he loves them. I have to admit that I haven’t made them probably in many years. I sometimes feel guilty because my favorite bars all contain chocolate. Mike likes chocolate, but I can’t say that he loves it like I do. So I was happy that I was making something that he would really enjoy. These bars turned out to be super simple to make. They have a cup of sour cream (minus two teaspoons that you save for the frosting) so they are nice and moist. 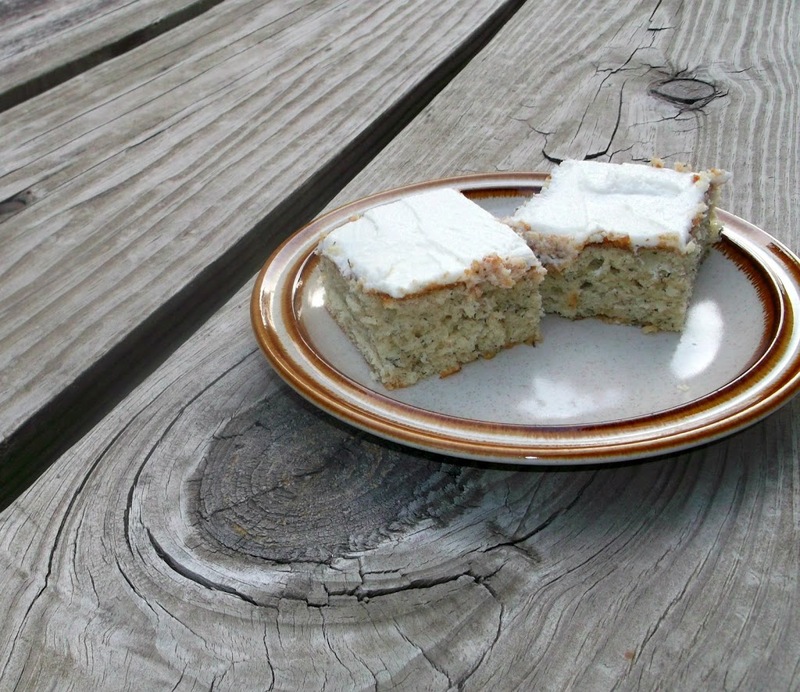 As these banana bars baked they filled the house with the sweet aroma, almost the smell of banana bread. 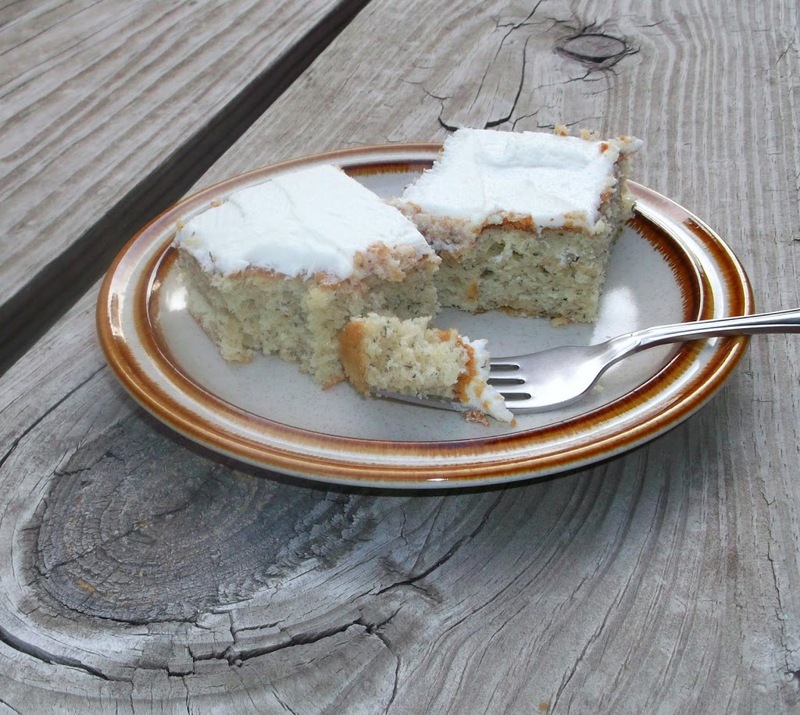 The frosting is a little different as I mentioned before it has two teaspoons of sour cream it, but it turned out creamy and went well with the bars. I think I made Mike’s day by making something new and not something chocolate. Our kids didn’t complain about having banana bars either. 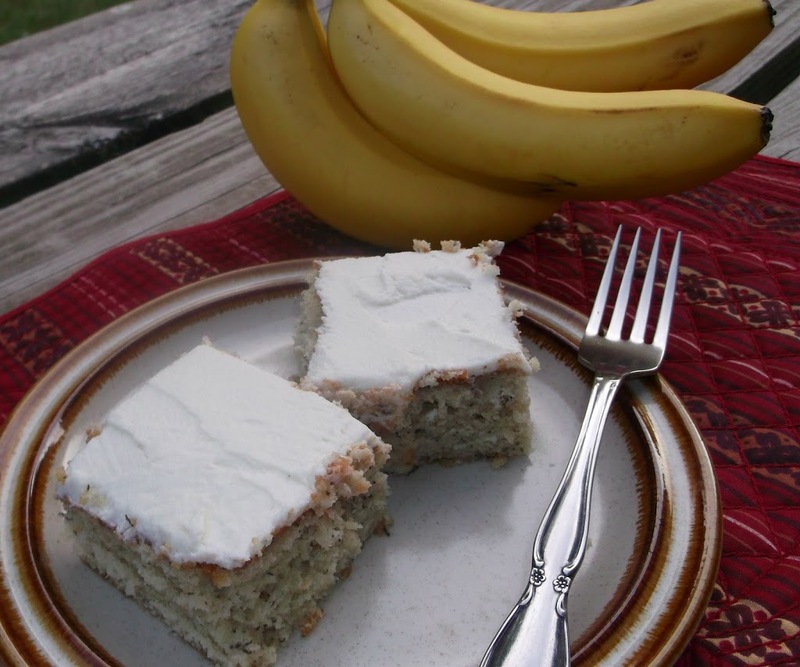 So if you have some over ripe bananas give them a try. I think you will enjoy them. Cream butter and sugar together until well mixed. Blend in eggs and mix in the sour cream, the mashed banana, and vanilla until well blended. Sift dry ingredients together and add to banana mixture mix until well blended. Spread into a well greased jelly roll pan. Bake in a preheated 375 degree F oven for 20 minutes. Cool completely and frost with frosting listed below. Add all ingredients into a medium bowl beat with an electric mixer until smooth and creamy. Spread on bars. They look and sound fabulous! Bookmarked for when I have over ripe bananas. YUM! Yum! I love banana bars! These look great! The frosting sounds amazing! Oh, yum, What a perfect treat to make with those over-ripe bananas we all end up with sometimes. I love the idea of a banana bar! And sour cream in the icing sounds delicious with the banana flavor! Mmmmm…I wonder if I could justify eating one of these for breakfast? They look SO good! mmm… that looks soo delicious! i will definitely try it out asap. thanks for sharing that great recipe. plus: i love your blog!